Google Express is a shopping mall featuring qualified retailers. To qualify for Google Express you must be enrolled in Shopping Actions. To sell on Google Express, you will first need to be approved for Shopping Actions. To receive approval, you need to connect your Zentail account to Google's Merchant Center. Once your products are in Merchant Center, Zentail will request a review of your Merchant Center account. Further onboarding steps are handled in the Merchant Center once you are enrolled in Shopping Actions. 1. Complete Google's Shopping Actions Interest Form . Under Order Management and Fulfillment Info, select the option to manage your orders using a "API Integration via 3rd Party Partner". In the new field that appears, enter "Zentail" as the partner. 4. In your Google Merchant Center, click the 3-vertical-dot icon on the top right of the page and click the SFTP / FTP / GCS menu option. 5. 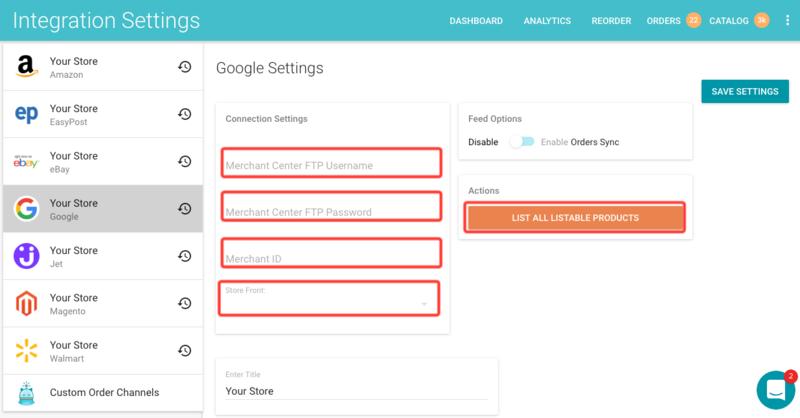 In your Integration Settings page, click on the Google card and enter your Merchant Center FTP Username, Merchant Center FTP Password, and your Merchant ID. *Please note, FTP not SFTP. * Select your Store Front from the dropdown. Click SAVE SETTINGS. 6. Set your SKUs to list to Google. This can be done in bulk by clicking LIST ALL LISTABLE PRODUCTS. This will list all of your SKUs to Google that are currently listed to your selected Store Front. Note: Google currently requires all SKUs in your Merchant Center feed to have an accompanying Store Front URL. 7. Wait 15 to 30 minutes. You should see a 'zentail' feed in the Products > Feeds section of your Merchant Center. Once you are approved for Shopping Actions! 8. In your Google Merchant Center, add Order manager and Payments manager to the Zentail user you added in step 3 above. 9. In your Google Merchant Center, opt your products into Shopping Actions. You may need to work with a graphic designer. We recommend this designer -- contact them by clicking Custom Order and sharing this link along with your logo. Once you've completed these steps, you can click REQUEST FINAL VALIDATION to enter Google's final review. Your price on Shopping Actions must be less than or equal to your webstore price. Your price on Google cannot be greater than the price on your webstore. If it is, the price you uploaded to be Google will be overwritten by the price on your webstore. If you're using a price override for your webstore, Zentail will automatically send the price override, unless you enter a price override for the Google integration.